Sturt Gallery and Ernabella Arts present In These HANDS: Mara nyangangka, an exhibition of new paintings, ceramics, tjanpi weavings and punu from the artists of Ernabella, celebrating 70 years of Ernabella Arts – the first of our now many community arts centres. It opens this weekend. The fruits of a partnership between Australia's two oldest centres for craft and design – Sturt Gallery & Studios (1941) and Ernabella Arts (1948), are the subject of this exhibition, curated jointly by Sturt's Slavica Zivkovic and Ernabella's Alison Milyika Carroll. 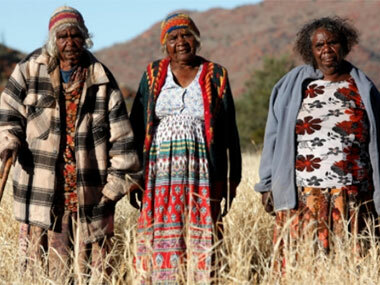 In 1968, Elisabeth Nagel, who led the Sturt Weaving Studio for 50 years, made her first visit to Ernabella – or Pukatja, as Anangu call it - with a desire to share knowledge of her craft. Subsequently, six young artists from Ernabella in two groups went to Sturt as part of a residency to learn new weaving techniques. One of those women, Atipalku Intjalki, who was just 17, is still alive and enjoyed a 40 year reunion with Nagel at the Sturt Studio earlier this year when this exhibition was first shown. Nagel, 87, whose works are in collections in the National Gallery of Australia and the National Library, is now retired and still lives near Sturt. “The amount the girls learned in such a short time was staggering,” she told The Australian. “Not just in the weaving but also in the environment they had entered. It was a world away from Ernabella”. In These HANDS: Mara nyangangka tells the story of that residency, its impact on the generations that followed – Atapalku's daughters Langaliki Lewis and Lynette Lewis have become artists, for instance - and offers a showcase of the contemporary work of senior artists including Pepai Jangala Carroll, Rupert Jack, Tjunkaya Tapaya and Alison Milyika Carroll alongside emerging Indigenous artists. In These HANDS not only tells the historical story of the link between these two famous centres, it celebrates the long tradition of craft and design in Australia while at the same time being testament to the positive partnership and understanding between Indigenous and non-Indigenous cultural institutions sharing that same passion for ‘making’. Some wall weavings and floor rugs from the early days of the exchange will be on show in the exhibition. “Our drawings are inside us, they are part of us in the same way we are part of this Country. Everyone works differently but we are all putting down our Country and our stories. We have strong law and culture, and this tells Anangu how to live. Our ways still remain the same, it never changes. Our law, our culture and the way we live – we would never want any of this to change. It keeps us strong”. Established in 1948 by the Presbyterian Church Mission, then developed by the legendary Winifred Hilliard from 1950, Ernabella Arts is Australia’s oldest, continuously running Indigenous Art Centre. Ernabella is at the eastern end of the Musgrave Ranges in the far north west of South Australia. Pukatja was the first permanent settlement on the Anangu Pitjantjatjara Yankunytjatjara Lands (APY Lands). A craft room was established in 1948, and the first craft products were hand-loomed woven fabrics and hand-pulled and knotted floor rugs with a unique pattern that became known as ‘the Ernabella walka’ or Anapalayaku walka (Ernabella’s design). They were made from the plain fleece wool that the shearing men on what was then a sheep station brought into the craft room for the women to spin. 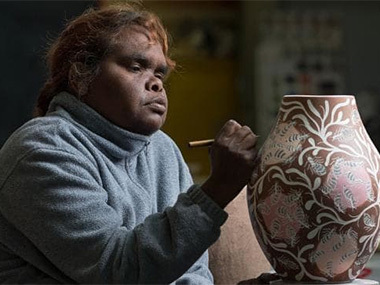 In recent years, long after starting to work as artists, senior women decided to leave behind the walka of the early days and to depict their Tjukurpa (sacred stories of country and law) in paintings and pottery. The Centre’s reputation lies in the adaptability and innovation of the artists who have been introduced to many different media since the craft room began. 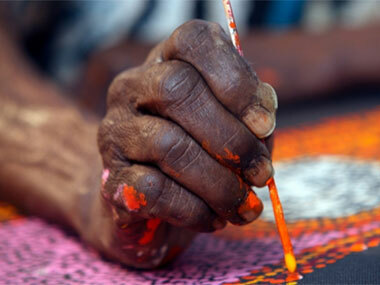 Ernabella Arts is an Aboriginal owned and run corporation which promotes and supports ethical practice in the creation and sale of Indigenous art. Sturt was founded in 1941 by Winifred West (1881-1971) when she retired as headmistress from Frensham, the independent secondary school for girls she'd established in 1913 in Mittagong.